Those tests do not work reliably. The reason is that the processing happens asynchronously, see the yellow arrows in this picture. A work around would be to wait for a while (Thread.sleep), but this is not very elegant, since I never know how long the processing will be, because some files are huge and some not, additionally the performance of each machine varies. So sleeping for a long time will solve the problem, but my tests will run a very long time. We will fail after 20 seconds, this value can be adjusted if it is not sufficient. But we will never wait longer the required. 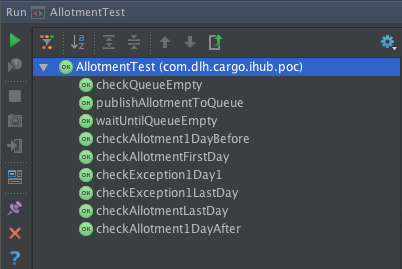 Theoretically there might be a racing condition, the we will check instantly that deliveringCount is 0 before it actually jumps to 1, but this has not happened to me before. In this case we could wait for maybe 1000ms at the beginning of the method (Yes, asynchronous is asynchronous). This solution should work with all Application Servers and standalone JMS implementations as long as they provide this information via JMX. I am currently running two Raspberry Pi, one for Icinga (see here for another blog post about this) and the other for OpenHAB. The experience has shown, that the SD cards in the Raspberry can get broken quickly. It is no problem to install Raspian, but I spent hours configuring everything and therefore I want to have a backup of my configuration. I have chosen "burp" as backup solution. A client that runs on each machine in the network, sending the backup data to the centrally running server. On each machine there is a burp server and client running that stores the data on the mounted Backup directory. 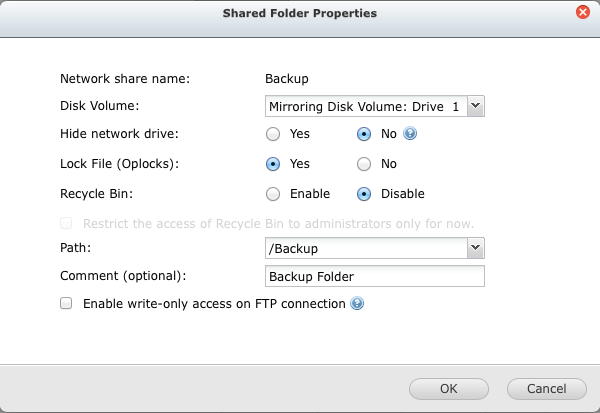 In this step we will create a Backup directory and export it via NFS to all clients that need it. In this case, check your configuration. 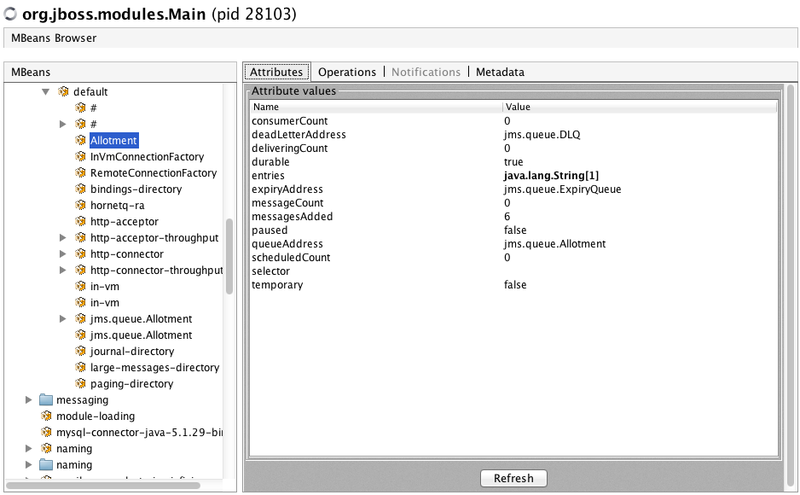 Burp has a more detailed documentation, but for the impatient, here is a short version. We need some dependencies, so additionally run "apt-get install librsync-dev libz-dev libssl-dev uthash-dev" for the rest that we need. The server will also automatically start after a reboot. 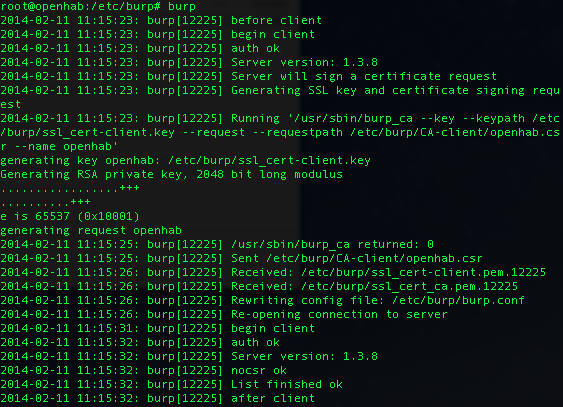 Simply launch "burp" and there will be some certificate magic which happens only the first time. 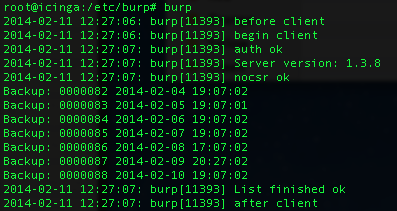 Note: "burp" implies "burp -a l" which is the command for list existing backups. So calling "burp" anytime will do no harm. Verify the backup with "burp" (which implies "burp -a l" for listing the backups). In this case we can see, that there were 88 backups done (one daily), each about after 24 hours. This will launch "burp -a b" three times per hour. 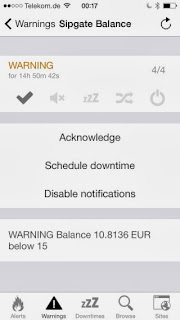 Note that the server configuration automatically reduces the frequency of backups to one daily. You can change this behavior if you need a higher frequent backup. Burp now runs and will automatically do daily backups. Surely burp allows you to browse historic backups, list the files and do restores. For example will "burp -a l -b 82" list all files that are contained in backup number 82. "burp -a r ..." allows you to restore files. The machines "icinga" and "openhab" store their backups in different directories. "icinga" has a directory called "deltas.forward" which contains the historic backups since this machine does backups for some longer time. I am able to access the files directly without any magic, which can be really nice in emergency situations. Some backup solutions work good, but require a running client installation in order to access the backup data. If you like this solutions, please add a comment. 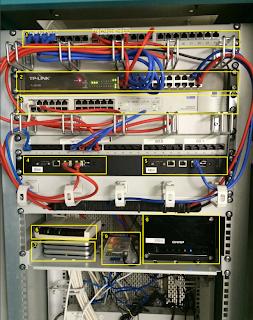 (5) Another Alix board in the same rack case running Askozia, an Asterisk distribution with a nice web front end. (9) A Raspberry Pi this blog is about! 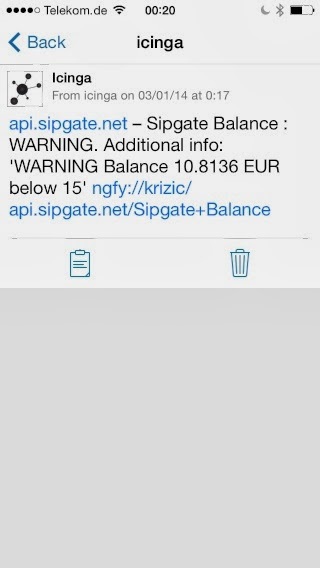 The connection between Asterisk and SIPgate is stuck and telephony does not work at all. Some of the Access Points in the house stop working correctly, mostly due to heat. This mostly happens in summer. The storage on the NAS is full, so backups of the Laptops stop working. The connection between Asterisk and SIPgate can be fixed by resetting the firewall state tables. The Access Points simply need a reboot or hard reset and continue working for months. The possibility to push notification on my iPhone and give me the possibility to take a deeper look on the reason. 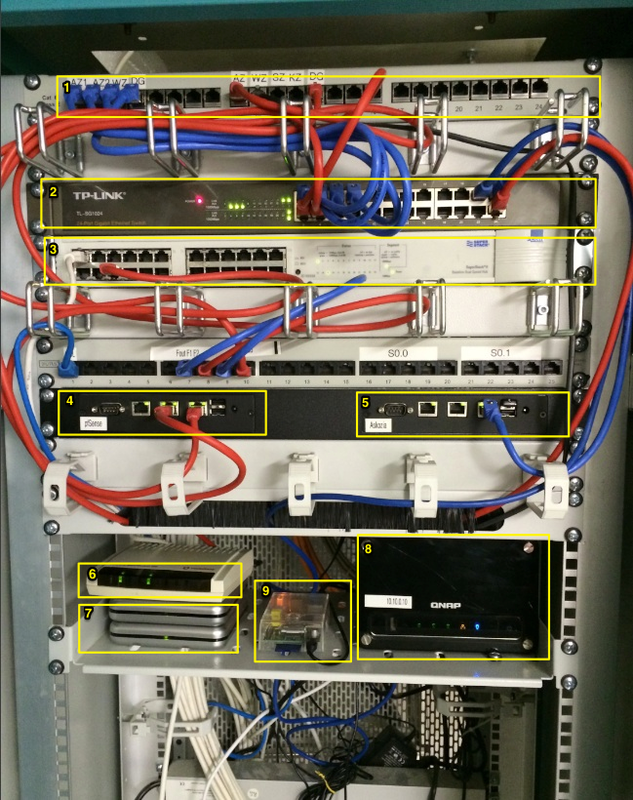 A separate and therefor independent infrastructure for monitoring. I did not want to add this monitoring to any of my existing devices and servers. 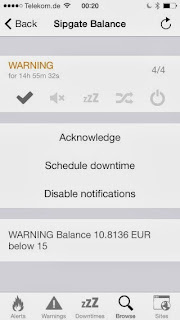 Notifications are pushed via Pushover to my iPhone, also available for Android. 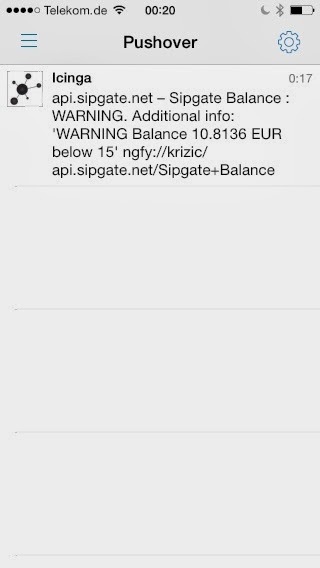 Nagify on the iPhone is a front end for Nagios and Icinga. I am sure that there is an alternative to Android. Nagify has some nifty features, that I will explain later. Buy an SD-card with at least 8 GB capacity. I have 32 GB, but this is far more then ever needed. 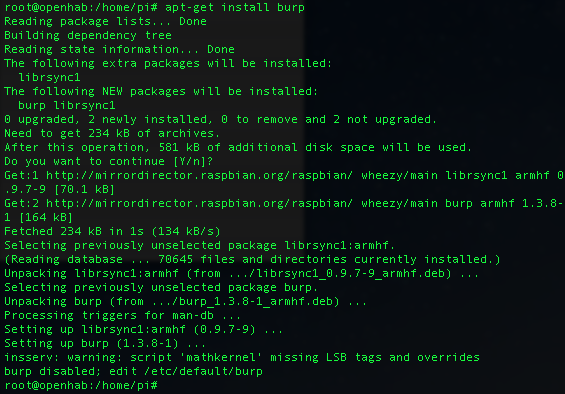 Download and install Raspbian. There is no need to use NOOBS. Enable if not already a DHCP server in the local network and connect the Pi to the local network using an Ethernet cable. Your DHCP server should be able to show you the IP address of the last assigned IP. Make it static and give it a nice DNS entry like "icinga" or "monitor" or whatever. 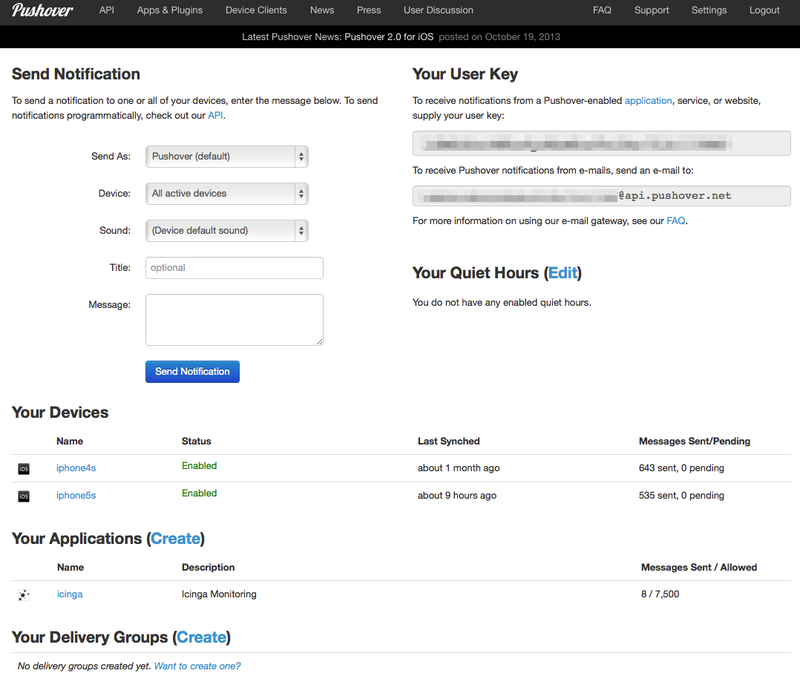 You should be able to login with "ssh pi@icinga" with the password "raspberry". 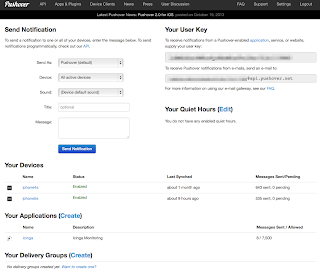 In my case there is no more password needed, because I added my public keys for ssh. It is fully compatible to Nagios so thousands of existing scripts e.g. 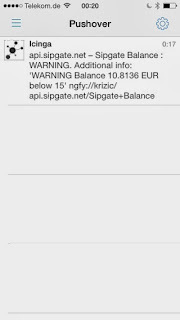 from Nagios Exchange can be used. 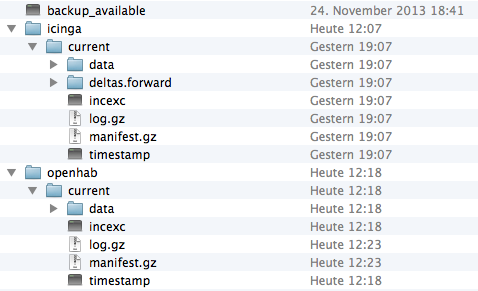 Install Icinga, MySQL, IDO2DB and Nagios-Plugins. This page offers a nice description. 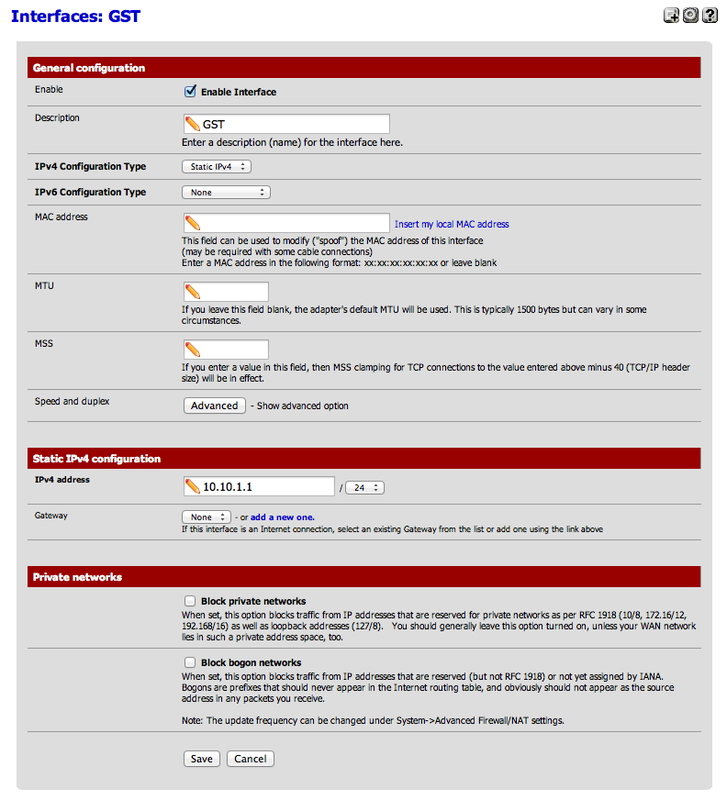 Learn how this configure Nagios(!) objects like Hosts, Host groups, Services and Service groups. The original Nagios document is very good. Understand that there is inheritance in the object definitions that can save a lot of time. The configurations basically happen by editing the *.cfg files. There are some tools that will help you, but I learned the format and how inheritance works so I am edit the files directly by my own. 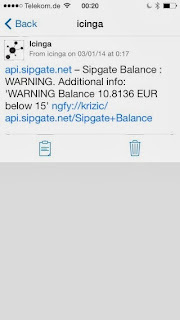 Nagify is an App for the iPhone that offers you basically the same functionality like the original Icinga web frontend. 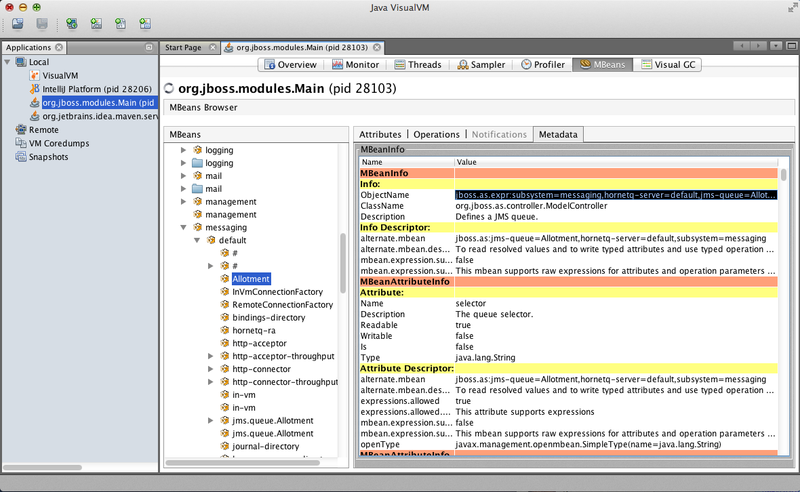 As the name suggests it was originally developed for Nagios, but also supports Icinga. If you have configured HTTPS/Dynamic DNS and the Port forwarding, you should be able to configure your external URL to Nagify so you will be able to check Icinga remotely. Take the script notify_by_pushover.sh and put it to your /usr/local/bin directory. 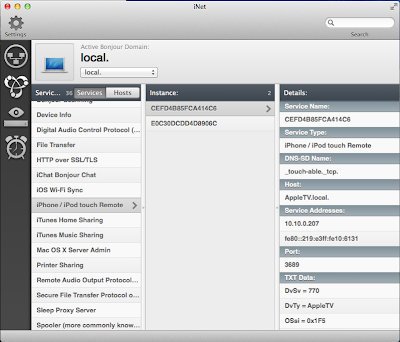 I prefer adding own data to /usr/local to have a clear separation and easier backup. As you can see, I found this script elsewhere, but I modified it to contain this "ngfy:"-URL which can be used by Pushover, you will see later. 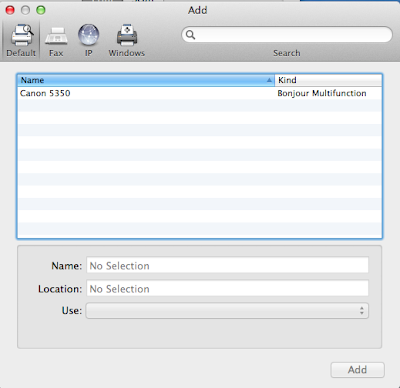 Configure the contacts and contact groups to actually use the Pushover commands and script to send notifications. This nice URL feature is described on the Nagify homepage under "FAQ" and "Launch by URL"
There is monitoring of Icinga itself. 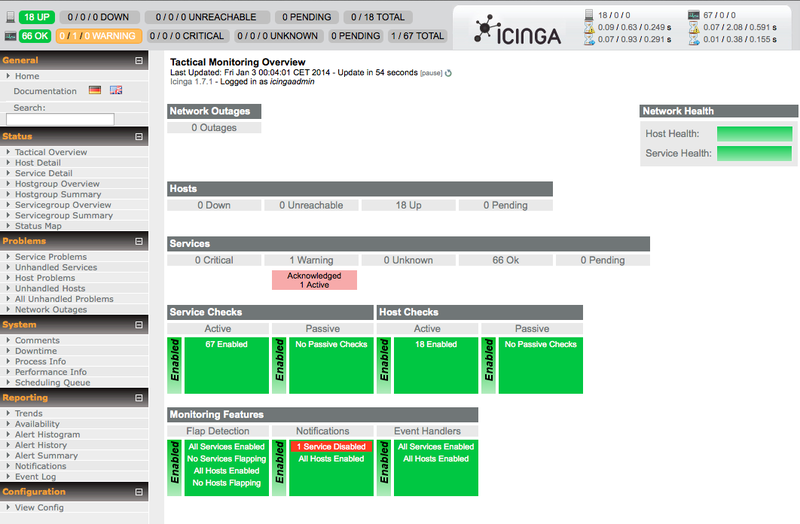 A solution would be to have a secondary instance of Icinga just for monitoring the first one. I ordered a rack mount for my Pi which offers space for two, so maybe the second slot get a Pi for exactly this. Pushover uses Apple's Pushover Notifications and Apple recommends not to use this type of notifications for business critical notifications, because Apple cannot guarantee that they will be delivered. I read into this and there are circumstances where messages can be lost, but for this business case the reliability is absolutely sufficient. 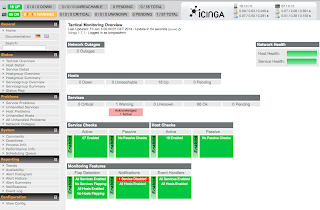 The Icinga installation and especially the object configuration needs to be backed up. I can imaging that running a Unix on a SD-card in read-write mode will wear it much, so there should be an easy way to re-setup Icinga on a new SD-card if the current gets worn out. I found a nice solution with my NAS. If you are interested in, contact me and I will write a blog post about it. I did not write much about the scripts that do the actual monitoring. Tell me if you want to know more. And last but not least, my Mac Mini which offers Screen Sharing via Bonjour. As you can see I have multiple Apple Airport Express devices spread over my house. 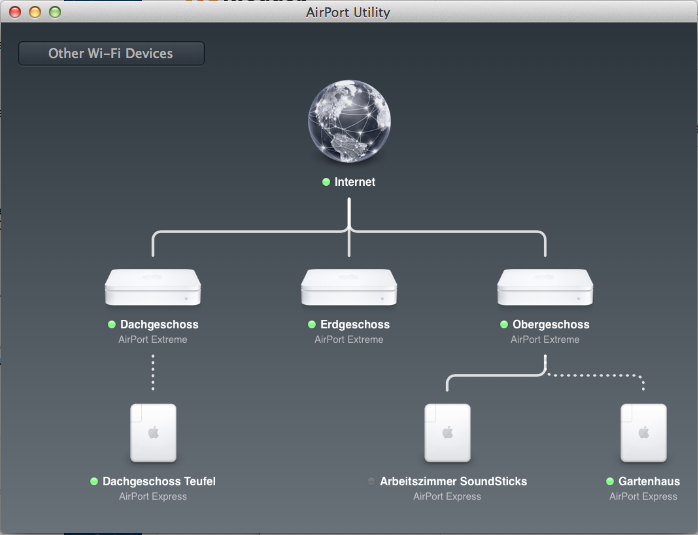 All three Airport Extreme are configured the same except different names and IP addresses. They are connected via my Gigabit Ethernet backbone. 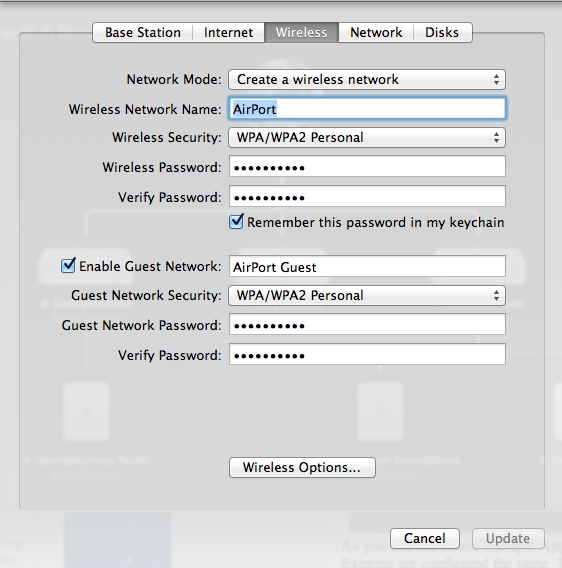 They offer wireless network called "AirPort" with the same password, so all devices automatically roam between the devices. My router is a an Alix 2d13 board in a 19" case from Varia (with a second Alix board) running pfSense. 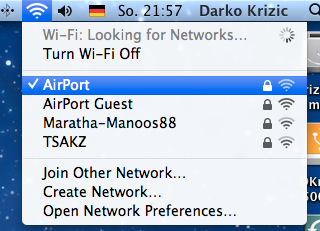 The Airport Extreme offers the possibility to activate a secondary Wifi offering a guest network. 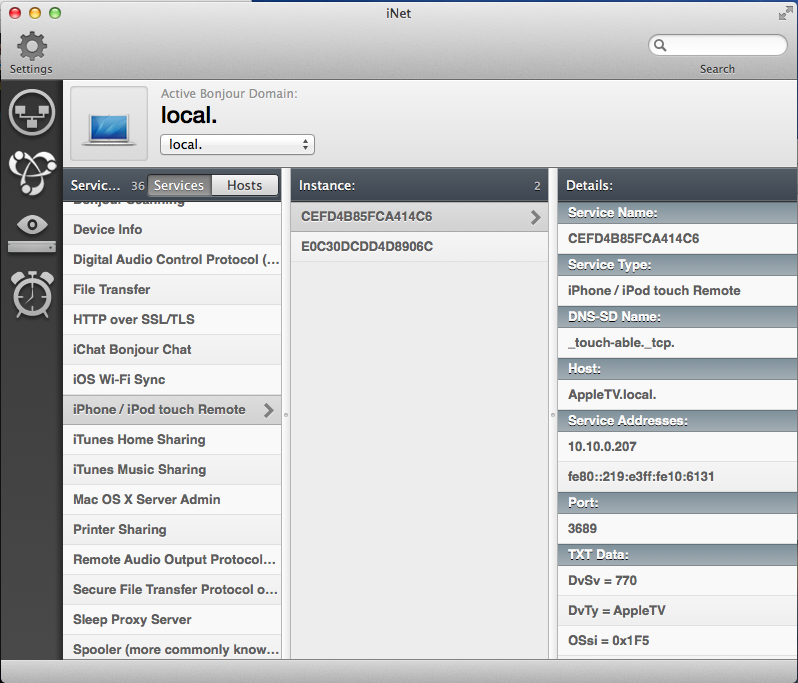 This feature offers a secondary Wifi network with a dedicated name and password. The traffic is routed strictly to the internet, so guests can have fast access to the internet without the possibility to infiltrate your network. So far so great. The documentation states that this feature only works if the Airport Extreme is either a router or there is another Airport Extreme in the same network. Neither is the case in my configuration. I still turned on the guest network and the behavior is: Nothing happens, no DHCP, no routing, nothing. Not surpring, because the DHCP service is run on pfSense where I never configured anything for a guest network. The question is: Can I use this feature in my environment? The answer is: Yes! And here is how. The real question is: How do the Airport Extremes share a single ethernet wiring for the main and the guest network. The solution is simple: VLAN tagging. Whereas the main Wifi uses untagged IP packets, the guest network uses a VLAN tag 1003. Not all routers are able to do VLAN tagging, this is the reason I use pfSense, because it surely can do this and much much more. In the main menu go to Interfaces, select (assign) and then VLAN. You will probably see no interfaces, click on + to add one. Clients connecting to the guest Wifi should get a DHCP address in the range 10.10.1.100 to 10.10.1.199 and appear in the lease list visible under Status and DHCP Leases. It is up on you if you want to allow yours guests the access to your internal infrastructure. You can still allow this, but add more rules to forbid access to a specific device. You always have the advantage that your guests do not have to know your primary Wifi password. I hope this blog posts help you setup a similar environment. Feel free to add a comment or a question.